The Great Race » Crossing the Pacific Ocean for the Ultimate Adventure! Crossing the Pacific Ocean for the Ultimate Adventure! 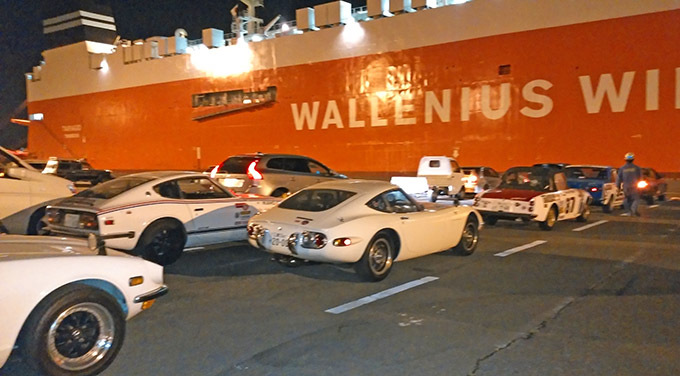 All eight cars coming to the Great Race from Japan arrived at the port at Yokohama Tuesday morning and were loaded on a cargo ship bound for Long Beach, California. They are expected to arrive in Long Beach on June 4 and be picked up later that week by Reliable Carriers for the journey to Kirkwood, Missouri. They will be stored there by Great Race friend Scott Brandt at his MotoeXotica classic car dealership. That is also where the Great Race technical inspections will be done on Thursday, June 18. The Japanese cars, ranging from an ultra-rare and exotic GT 2000 to a 240Z, will return to Japan after the race. In all, 30 Japanese drivers, navigators, support crew and media will be participating in the nine-day, 2,400-mile Great Race from Kirkwood to Santa Monica. As a proud owner of a 1972 240-Z, and a good friend of a participant in this years Great Race, I am excited and proud to see the participation of these classic japanese vehicles. I wish them all the best of luck, and hope it is a pleasant experience.